On Saturday, four folks on a stag do came to my studio to do some carving. It was a lovely sunny day and it felt great to be back doing some woodcarving tuition again. Garry and Hamon decided to carve faces in relief onto pieces of oak. They used a variety of gouges and chisels to create them and the finished pieces were very dynamic. We all felt that they worked well. 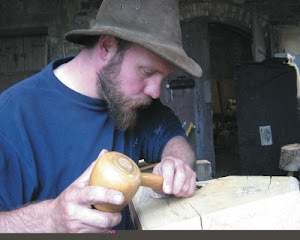 Pete and Lorraine chose to carve spoons from fruit woods (plum and cherry). This gave them the chance to use a mallet and froe, drawknife, hook knife, three kinds of fixed-blade and whittling knives, three types of small axe (Scandinavian-style hatchet, Kentish pattern and Swedish Carving) and spoon-bit gouges. Pete really enjoyed using the Kentish pattern axe and Lorraine the drawknife. They both agreed that spoonbit (short bent) gouges worked far better for them than hook knives when hollowing out the spoon bowls. It's great giving people the chance to try a range of tools to see for themselves how certain ones just feel better when working than others. Providing all of the tools on offer are of good quality, the most comfortable to use can sometimes really just depend on the user. When I bought my carving axe, the sales advisor recommended that I hold all of the dozen available ones there to see which felt right for me. It was a real surprise to discover how different they all felt, even though they were all handmade by the same people to the same design. Everyone got well into their carving and seemed very happy with what they made. Once the carving had finished, we ended the session with a little nip of homemade blackberry whiskey for the non-drivers. A lovely afternoon! 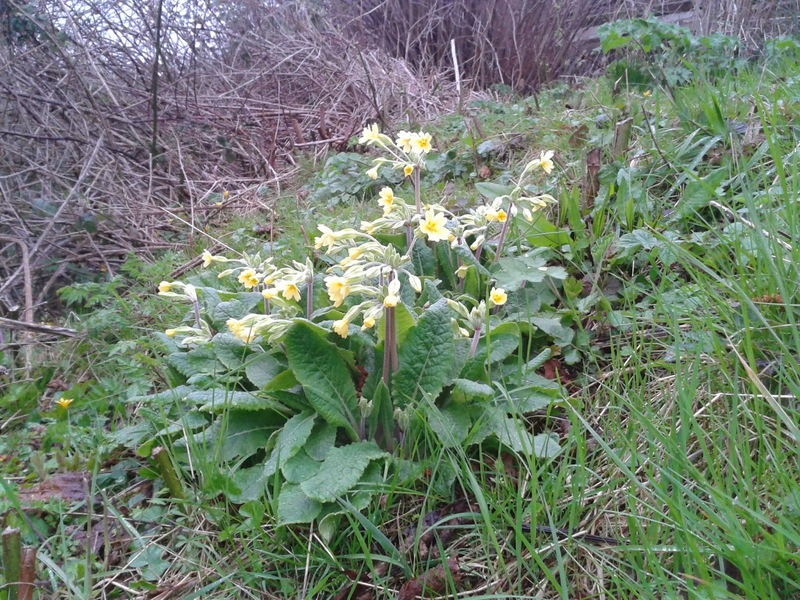 Tuesday was my last day working as Environmental Officer at Boiling Wells in St Werburghs. I've been working there regularly in different roles for four and a half years, but now I have to go. I must admit that I'll miss working there every week, Boiling Wells is a very special place. The last session went very well though. 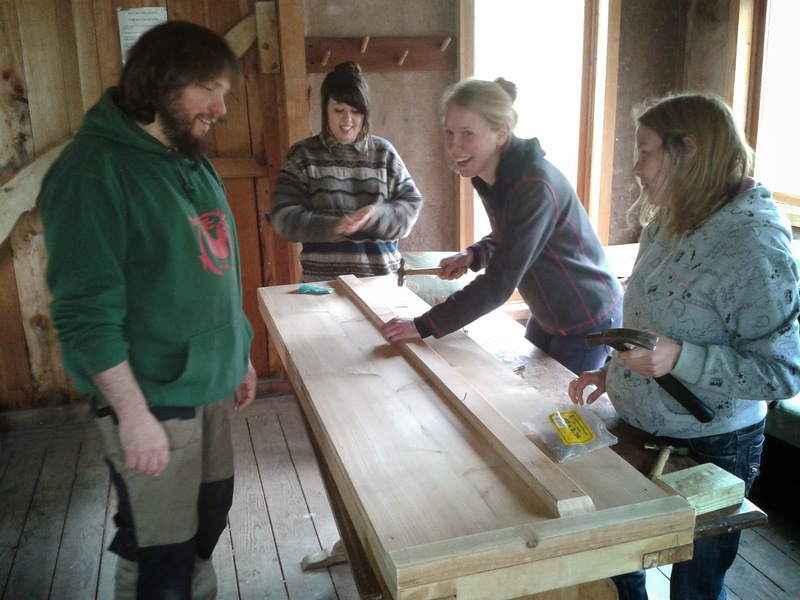 The group of volunteers who came to help worked hard with me on making some doors for the roundhouse on the site. Although we didn't have time to finish them, they will look great when done. 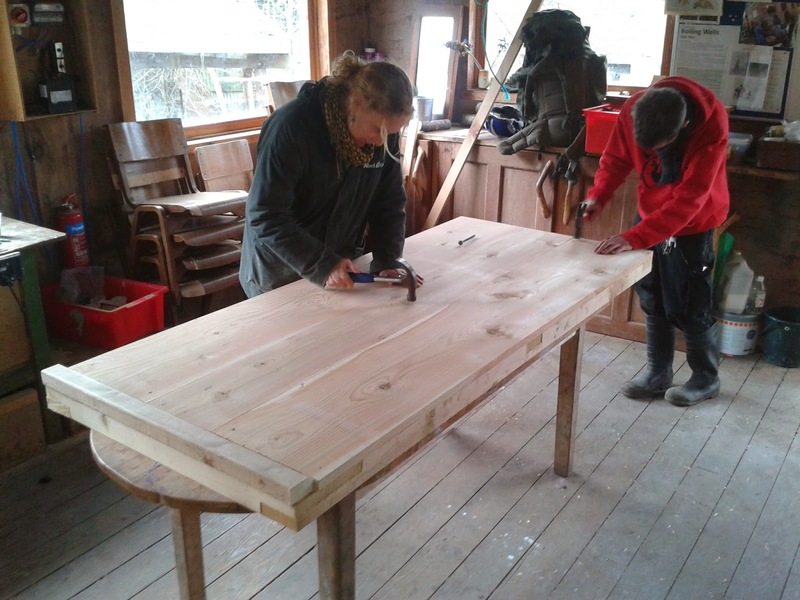 Maintaining the site will be left in the capable hands of Bill, the new Estates and Livestock manager for St Werburghs City Farm. Hopefully, I'll still be going down occasionally to help on certain projects. 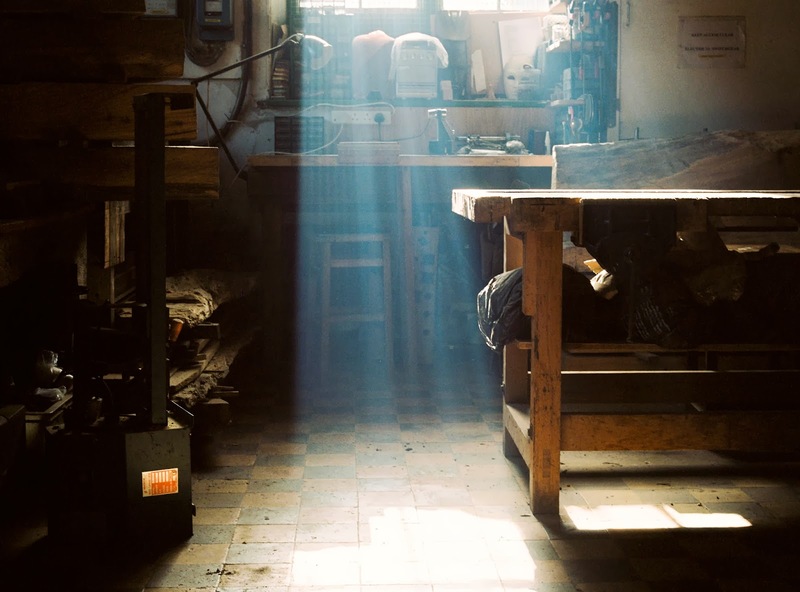 My friend Joe Williams is a talented photographer and got this shot of my workshop a few days ago. I really like it.